Put all sauce ingredients in a blender, blend and taste if youâd like to add sweetness to it. Pour sauce into pan and heat for 5 minutes, then put in a separate bowl. Spice the chicken with salt and pepper. Add the cornstarch and rub the chicken with it. Boil the broccoli for about 5 minutes; watch that it doesnât get too soft. Place a paper towel on a plate and lay the chopped vegetables on it. Cook the onion in olive oil and chicken for about 4 minutes. Make sure the chicken is cooked. 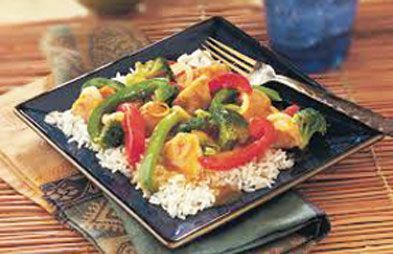 Throw in the rest of the vegetables and stir-fry for 2 minutes. Add drops of sauce between each stir. Repeat, adding a few tbsp every 15 seconds for the sauce to cook down. Serve as a side dish or by itself. Tips â If you are using frozen and not fresh vegetables, then make sure they are room temperature.